The accommodation in our family house comprises an independent self catering apartment "Garance" which has a door opening directly on to the park. It is fully equipped for 2 adults to stay 3 nights minimum (125 euros per night). There is also a nice cottage «Le Galamp» for 2 to 4 adults in the outbuildings. WARNING : For safety and quietness reasons, Domaine de Maran is not suitable for children. In the heart of the Cathar country, just 4km from the Canal du Midi and the tremendous medieval walled Cité de Carcassonne, close to a golf course, our stylish family mansion comprises an independent self catering apartment "Garance", with private terrace, for two adults. We have a pleasant park, an outdoor swimming pool and walkways….. peace and quietness guaranteed. There is also a nice cottage «Le Galamp» for 2 to 4 adults in the outbuildings of the Domaine de Maran. We are located between the Pyrenees Mountains and the Mediterranean Sea in the heart of the Languedoc region, famous for its cultural heritage and wine-growing. The Cité de Carcassonne (the tremendous medieval gallo-roman walled city build on a rocky spur) and the Canal du Midi, both included on the UNESCO World Heritage List in 1997, are just 4 km away. The Abbeys of Fontfroide, Lagrasse and Saint Hilaire are close to the estate. The vineyards of the Corbieres and Minervois dominate the area, while highlighting the famous cathar castles. In 2005, a red wine from Minervois was awarded as 'The Best Wine in the World' !! 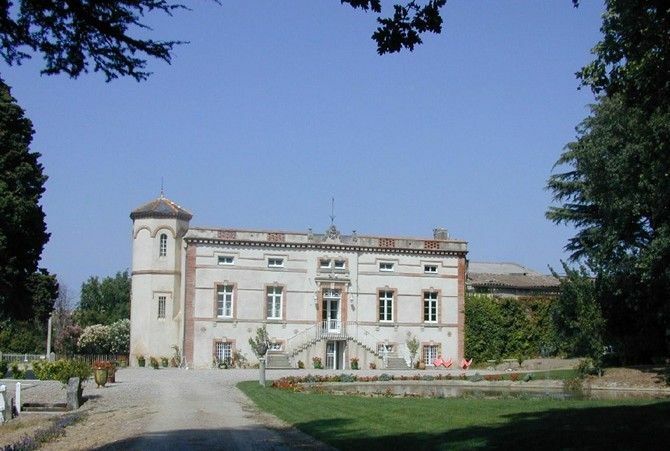 Domaine de Maran is an ancient family wine estate. The main building was rebuilt at the beginning of the XIXth century on a site inhabited since the XIIIth century. Gourmets will appreciate seven Michelin-stared restaurants (1 and 2 stars) nearby and one 3 stars restaurant within easy driving distance. Smart clean and tidy with everything one could wish for. Host and hostess very helpful and efficient. Lovely swimming pool and far enough out of Carcassonne to avoid the crowds but near enough to visit and 5 minutes to a selection of shops. Fully recommend for a quality stay for two people. stay with us. You have been ideal and perfect guests ! We wish you a nice summer and perhaps see you another time, with your beautiful car. Beautiful property in beautiful surroundings. Alice was a great host and the property was beautiful. I definitely plan to visit again and I highly recommend this property. Price : The self catering apartment "Garance" has a door opening directly on to the park. It is fully equipped for 2 adults to stay 3 nights minimum (125 euros per night). - Access to the park is strictly reserved for our guests. - Pets are not allowed. - Private car park. For a longer stay, you can also visit our cottage (gite) "Le Galamp" Booking : - For booking from outside of France : we need, as a guarantee and to secure your reservation, your credit card number (+ type and expiration date). Please provide this information by e-mail or phone. - Bank transfer is accepted as well. Please note that we ask our guests to cover all banking fees (exchange, transfer, etc). Be sure and let your bank know that the amount being sent should be “NET” and any costs will be paid by the sender.